The scandalous power purchase agreements the Ceylon Electricity Board (CEB) has entered into with retired Independent Power Plants, has dearly cost the country’s coffers.This was revealed in the Committee on Public Enterprises (COPE) report dated August 27, 2018. Entering into these agreements bypassing Government procurement procedure is alleged to have become a money spinning ‘business’ to certain high-ranking CEB officials and its line ministry- the Ministry of Power and Renewable Energy. Astonishing revelations show how the CEB with the concurrence of the Ministry of Power and Renewable Energy (MOPRE) has signed agreements with retired Independent Power Plants (IPP) granting undue benefits to the supplier (power plant owners) thus depriving the electricity consumers the opportunity to obtain low cost electricity. Given this background, CEB employees are gearing up to lodge a complaint with the Financial Crimes Investigation Division (FCID), reliable CEB officials told the Daily Mirror on conditions of anonymity . e PLC in 2002, for ten years and the contract lapsed in 2012. In order to provide electricity uninterruptedly, the CEB in 2005 entered into yet another a ten-year agreement with 100MW ACE Power Embilipitiya which too is a subsidiary of Aitken Spence PLC. This agreement lapsed in 2015. According to the respective agreements payments were to be made to the national grid not only for the units that were supplied, but also to settle the loans that had been obtained to construct the power plants and its interest component as well. Therefore the calculations were done accordingly. The capital cost, interest and return on equity were calculated and included in the unit cost that was settled monthly. After the contract lapses, the party to the agreement was to acquire all IPPs. But failure to acquire these retired power plants and re-entering into agreements with them, made the CEB incur huge losses. ACE Power Embilipitiya had invested approximately US $ 18 million on the power plant while ACE Power Matara approximately US $ 22 million and Asia Power approximately US $ 40 million. As per the agreements these payments were done in US Dollars. Before the enactment of the Sri Lanka Electricity Act No: 20 of 2009, the CEB was able to enter into agreements with IPPs without following tender procedures. However after the Electricity Act of 2009 came into effect, the CEB, had to call tenders to select the supplier whose offer was the lowest when there was a need to procure electricity as per Section 43 of the same. But Section 43 further vests powers in the cabinet allowing the CEB to procure electricity without calling for tenders on two occasions. They are- (1) when the country is facing a power crisis or (2) at a time when there is a breakdown at a major power station. Even though, the Electricity Act (amended) stipulates these conditions, certain high officials at the MOPRE and CEB kept on entering into agreements with ACE Power Matara and ACE Power Embilipitiya to procure electricity bypassing the tender procedure. After the first agreements lapsed, in 2016 MOPRE is alleged to have misled the Cabinet and obtained its approval to procure emergency power, claiming there is a national calamity. Receiving Cabinet approval, CEB entered into an agreement with ACE Power Embilipitiya for one year where the Public Utilities Commission of Sri Lanka (PUCSL) has issued a no objection letter to procure electricity on emergency basis if there was a power crisis situation in the country. Once this agreement lapsed in 2017, again the cabinet had been misled and the agreement had been extended by another year without the PUCSL permission. By misleading the cabinet once again, the CEB entered into a six month agreement with ACE Power Matara and the term was extended by another six months in the guise of a looming crisis situation. The PUCSL, which is the regulator for electricity industry in the country, has neither granted the generation license to ACE Power Embilipitiya nor approved the agreements both parties entered into in 2016 and 2017. It was the same with ACE Power Matara as well. “This is against the Electricity Act No: 20 of 2009 as amended. The PUCSL has the authority to take legal action against this illegal power generation. According to Section 43 of the Electricity Act, licenses could be granted to IPPs for power generation only after considering the lowest bidder after following the procurement guidelines. Since the CEB entered into agreements to purchase electricity, without following the guidelines stipulated in Section 43 of the Electricity Act, the PUCSL correctly refused to grant the licenses, although the CEB says they entered into the agreement based on the Cabinet Approval,” sources added. Questions have now been raised as to why the CEB with the concurrence of the line Ministry entered into new agreements with the same suppliers once again without following Government procurement guidelines? This is despite recommendations being made to the Cabinet on January 9, 2017 (Ref: MF/PE/CM/2017/04) by the then Finance Minister Ravi Karunanayake. In his recommendations, Minister Karunanayake had given approval to procure electricity for a shorter period until the CEB acquires the retired IPPs. According to the documents this newspaper is in possession of, Secretary Power and Renewable Energy had not made attempts to purchase any of the three retired IPPs and instead had continued obtaining Cabinet approval claiming that the country is facing a power crisis. When the Committee on Public Enterprises (COPE) summoned Ministry Secretary B.M.S. Batagoda and the CEB higher officials on August 7, 2018, Batagoda had confirmed with the COPE that although there were plans to acquire these retired IPPs, it was the Technical Evaluation Committee and the Procurement Board that had not agreed to acquire the plants for the prices quoted by the power plant owners. The COPE report dated August 27, 2018 further states as to how the CEB through its agreement with ACE Power Embilipitiya has to pay Rs.2.736 billion for the next three years as investment cost whereas they could have saved Rs.101 million had they acquired the plant for the price submitted by ACE Power Embilipitiya which was Rs.2.635 billion. Be that as it may, the CEB and the MOPRE not only ignored the Cabinet decision to procure power following tender guidelines, but also have agreed to pay these retired IPPs once again, the capital they have invested and its interest component. The sources further alleged that the reason to pay the capital and the interest over and over cannot be considered as an error, but has been done purposely as part of this money is alleged to have gone to the hands of certain higher officials at the MOPRE and CEB. “Paying back the capital investment and its interest component was strictly confined to its first term, but not beyond that period. The total project cost was forced into the tariff during the initial agreement period, but by paying the project cost over and over again even after it was settled, the CEB has deliberately burdened the cash-strapped national coffers. They deliberately failed to acquire these power plants despite receiving advice from the Finance Ministry. Not only had they failed to abide by the Finance Minister’s recommendations, but also to follow competitive tender processes. Had they called for tenders from all IPPs, they would have send their bids and the CEB would have obtained from the lowest bidder benefiting the country,” sources said. It had come to light as to how the CEB had paid ACE Power Embilipitiya for the period 2016/2017 a staggering Rs.912 million as compulsory payment (capital investment and interest). When the agreement was extended in 2017 once again another Rs.912 million had been paid as compulsory payment. For two years since 2016 to 2018, the CEB had paid Rs.1.824 billion to the supplier fraudulently. In the second agreement CEB entered into with ACE Power Matara in 2017, a compulsory payment of approximately Rs.420 million had been made. After the laps of agreements with retired IPPs in 2018, in submitting yet another misleading Cabinet memorandum on March 15, 2018, MOPRE Secretary had sought Cabinet approval to re-enter into agreements with the said three retired IPPs for three years based on a collective decision taken by the CEB Board of Directors. The Cabinet on March 28, 2018 had granted its approval to MOPRE’s proposal. The CEB had then requested the three retired IPPs to obtain power generation licenses from PUCSL or no objection letters for the extension of PPAs for three years. “When Chairman Ganegala requested DGM (Energy Purchase) Eng. Sujeewa Abeywickrama, that he (Chairman) intends to sign the PPA with ACE Power Embilipitiya on April 5, 2018, Abeywickrama said that he couldn’t prepare agreement papers without the cabinet approval document. Since pressure was mounted on Abeywickrama, by e-mail, he (Abeywickrama –DGM (EP) had submitted a draft PPA to AGM, P. L. G. Kariyawasam for three years as per the Cabinet memorandum. DGM (EP) had sent the e-mail to Kariyawasam on April 5, 2018 at 17.40 hrs. 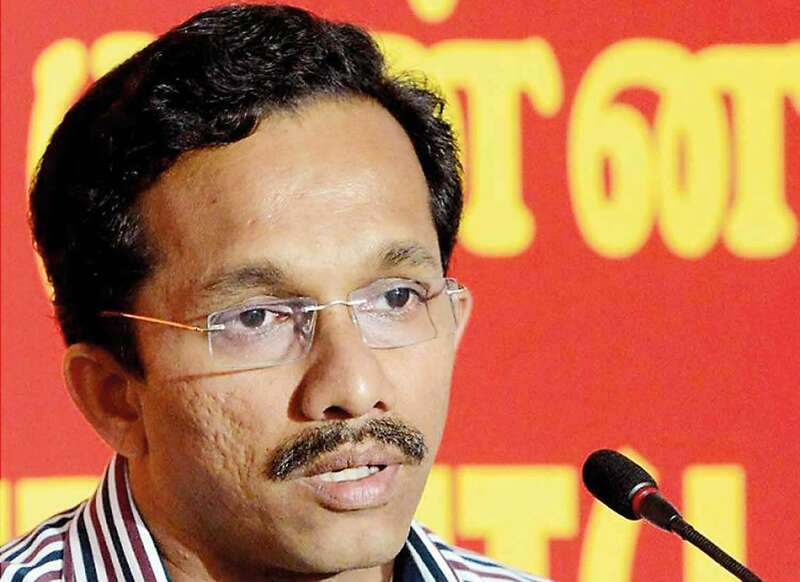 In his e-mail, Abeywickrama had instructed Kariyawasam to obtain the Cabinet decision paper and the legal clearance prior to signing the agreement,” sources said. However despite of DGM (EP) request, a few hours after submitting the draft PPA on April 5, the Chairman had signed the PPA the same evening while GM and AGM (Transmission) signed as the witnesses. It is alleged that the second signatory to the agreement- the Deputy Chairman had signed the document the following day- April 6. Meanwhile CEB documents reveal that the legal clearance had been obtained from the Chief Legal Officer on April 6, but not before the Chairman placed his signature to the agreement. 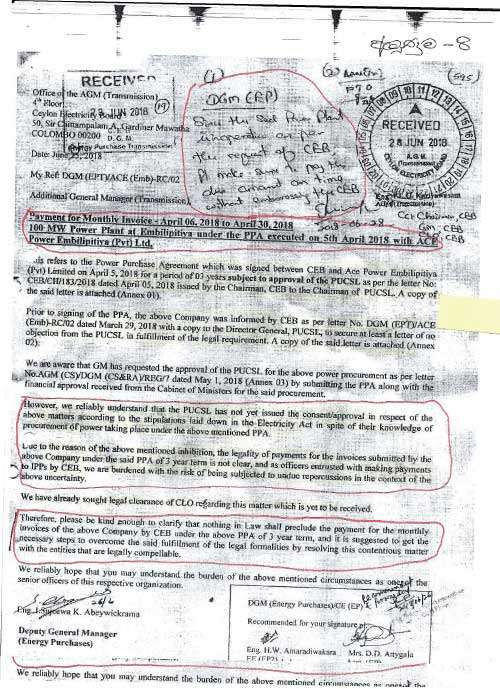 According to documents this newspaper is in possession of, the question arises as to why the CEB hurriedly entered into the said agreement on the verbal instructions on the claim made by the Ministry Secretary’s that the Cabinet of Ministers had granted approval to the memorandum submitted. It is learned that by the time the agreement had been signed, the CEB had not received the Cabinet approval letter, but received it only on April 10- five days after entering into the agreement. Chairman COPE, JVP MP Sunil Handunnetti told the that there are no provisions for any Government institution to enter into any agreement based on a Cabinet approval unless they receive the approval in writing. “We raised this issue in the COPE meeting held on August 7,” Handunnetti said. Meanwhile, General Manager CEB, by letters dated May 1, and July 12, 2018 had sought approval from PUCSL to procure electricity from these three retired IPPs to which, the latter had asked CEB to provide details under which clause of the Electricity Act, they are asking for approvals to procure electricity without following tender procedure. 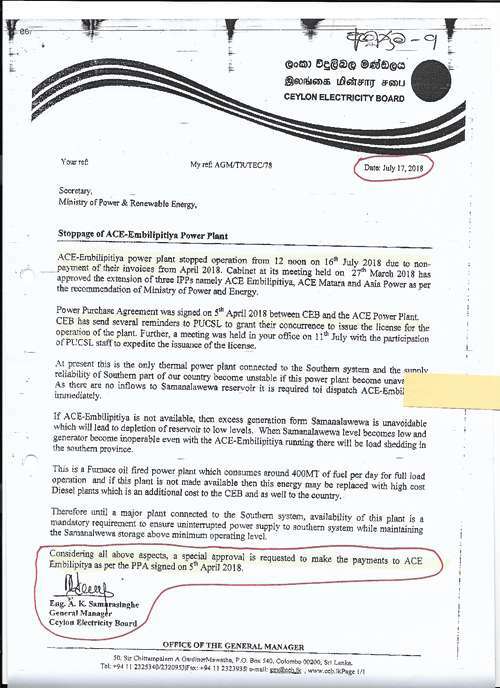 Meanwhile ACE Power Embilipitiya, sent its April invoice (April 6 to 30) which was approximately Rs.850 million to which, DGM (EP) had refused to authorise the payment. This is because the PUCSL had not granted them the power generation license. This led the CEB to interdict him from service from July 12, 2018. “Although the reason for the interdiction was for his refusal to authorise the payment, the charges levelled against him were based on an inquiry for going against him at the National Transport Commission,” sources claimed. 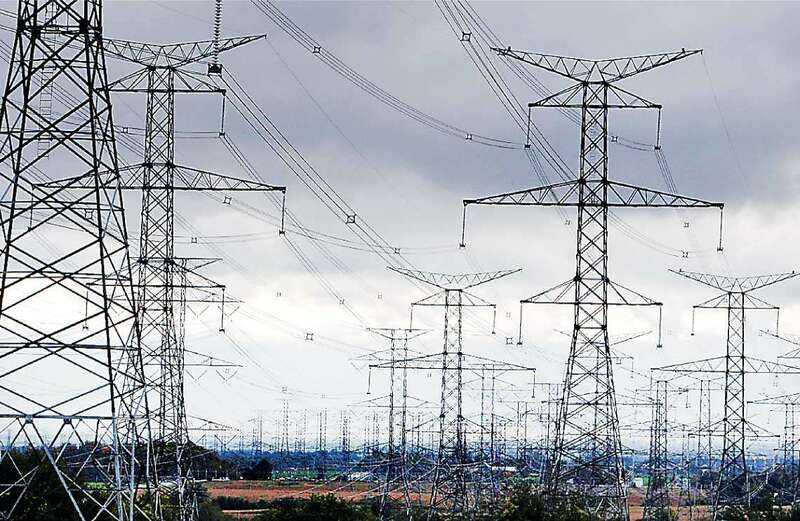 As the CEB failed to make payments, ACE Power Embilipitiya had stopped generating power for the national grid from July 16, 2018 which led the GM to make a request by letter dated July 17 to the Secretary MOPRE to resolve the matter. Secretary Batagoda on the same day, had granted approval to the Chairman and GM to settle the outstanding payments to the investor based on approval of the Cabinet. However in the same letter, Batagoda had stated that the Electricity Act did not provide provisions for extension of retired IPPs. “While authorising to make this illegal payment, he has also stressed that there is no provisions to do so. This is a joke,” CEB sources added. Hence a new DGM (EP) had been appointed and on his orders, Assistant Finance Manager (Transmission) and Accountant (Energy Purchase) on July 18 had authorised the payments, violating the Electricity Act. Meanwhile, B.M.S. Batagoda by a letter dated August 6, 2018, to Secretary to the President, has made a request to direct the PUCSL to issue approvals to extend PPAs of IPPs- 24 MW Ace Power Matara, 51MW Asia Power and 100MW Ace Power Embilipitiya for three years as approved by the Cabinet until new power plants which have been planned will be commissioned from 2021. The letter further states that the unit cost of these three power plants are lower than most of the other thermal plants in operation. “Once again Batagoda has tried to mislead the President’s Office by claiming that these three retired IPP supply electricity at the lowest price per unit. Questions are raised as to what made Batagoda to make such a claim when there is sufficient documentary evidence to show how solar, wind and few other IPPs that were selected following a tender procedure supply low cost electricity to the national grid. 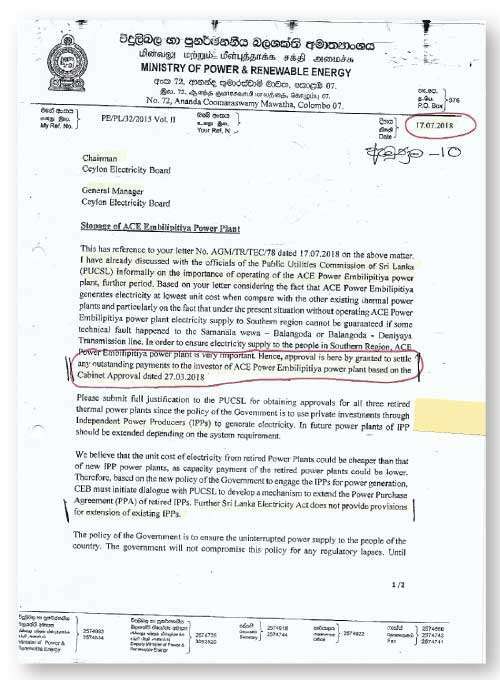 Although Batagoda in his letter says that the average unit cost of ACE Power Embilipitiya is Rs.23.64, ACE Power Matara is Rs.24.41 and Asia Power is Rs.24.69, he has failed to state in his letter as to how the CEB, after following procurement guidelines, are to procure electricity at a lower cost from 10MW Vavunathiv Solar Plant (Rs.11.86), LNG Kerawalapitiya (Rs.14.99) and 10MW Chunnakam Wind Plant (Rs.10.07)once they are commissioned,” sources further claimed. Batagoda’s letter further states, ‘In terms of Section 13 of Electricity (amendment) Act, Section 43 of principal enactment has been amended. According to this amendment, Section 43-2(a), the Commission can grant approval for power plants which had been in operation on the approval of the Cabinet of Ministers prior to the date when this act came into force. According to sub section 4 (a) of Section 43 of the Act, the power plants which have received the approval of Cabinet of Ministers prior to the date of this act coming into force has been exempted from the requirement to submit competitive tender’. At the moment the price at which ACE Power Embilipitiya supplies us is Rs.23.64. Although Batagoda says that as such, page 13 of the COPE report dated August 27, 2018 states that when purchasing electricity after the lapse of the earlier agreements, the CEB has to abide by the Electricity Act (amended) and follow procurement guidelines when purchasing electricity. Media Spokesman CEB, Director Development Surakshana Jayawardena refuting the allegations said that there is no necessity to call for tenders from the three retired IPPs as they received Cabinet approval prior to the date the amended Act came into force. “Although there are allegations, the CEB cannot interrupt the power supply and that is why we have continuously obtained Cabinet approval to purchase power from retired IPPs. When instructions were given to acquire the retired IPPs, we obtained the Government valuation. The prices these owners submitted were higher compared to the valuation of the government. They did not agree with the report of the Government valuer. As the CEB cannot afford their prices, it was recommended to procure electricity for a period of three years which is beneficial to us. If we enter into agreements more than three years, it would not be beneficial to the CEB,” Jayawardena said. He further added that by year 2020, CEB will have its own plants and there won’t be a necessity to acquire these depreciated power plants. When asked as to why the CEB is still paying the capital cost to these retired IPPs when this payment was strictly confined to its first term, Jayawardena asked as to how the IPPs could cover the continually repair charges, staff wages and other rehabilitation work if the CEB pays only for the generation cost? He further said that it is cheaper to purchase electricity from these three retired IPPs rather than going for tender procedures, because there is a possibility of them bidding at a higher amount than the price at which they are supplying the national grid. “At the moment the price at which ACE Power Embilipitiya supplies us is Rs.23.64. In the event we call for tenders, they will increase their prices knowing that the new competitors cannot supply for a lower rate as they have to pay for the Environmental Impact Assessment reports, to obtain the equipment for the power plants and for other additional costs. So it is beneficial for the country to extend the agreements with these retired IPPs rather than call for tenders to procure electricity,” Jayawardena said. When asked as to why the CEB hurriedly signed the three year contract with ACE Power Embilipitiya on April 5, 2018 before they received the Cabinet approval document, Jayawardena did not agree with the allegation, but said that the CEB will never enter into an agreement unless they receive the necessary approvals in writing. Nalin Edirisinghe, Director Licensing Division PUCSL, meanwhile told the Daily Mirror, that the CEB’s claim that even after the first term ends, the CEB has to keep on paying the IPPs the capacity charges to run the plant is a blatant lie.“CEB’s claim cannot be accepted as these plants have been in operation for 10 years only. Easily they have a lifespan of 20 years or more. And if we check what CEB has spent after taking over the Barge mounted power plant, we can have an idea of any rehabilitation costs. That plant was used in Sri Lanka for 15 years and for a few more years elsewhere before it was brought to Sri Lanka. There are few components in the capacity charges agreed on for these plants, one for Return on Equity; Equity is fully paid so no need to pay this (in case of ACE Embilipitiya this payment is Rs. 58 Million per month), and there is a fixed O&M that covers salary, etc.. Then you have variable O&M and fuel cost in the energy charge. In the case of ACE Embilipitiya, fixed O&M and variable O&M have increased from the last year (of the PPA) figure and the fuel rate has remained constant,” Edirisinghe said. With regard to the allegations the CEB has levelled against PUCSL for not granting generation license to retired IPPs, which is against the Electricity Act No: 20 of 2009 (amended), Edirisinghe said that Sri Lanka Electricity Act stipulates the requirements to be followed in addition of new power plants is Section 43 of the Act. “In the Act, there is no specific Section to accommodate extension of retired plants, thus it is not recognised in the Law, and so it must be treated as a new addition. Globally, the thermal plants are not having a going concern after the PPA period and thus PPAs are modelled as such; where the total capital is paid off by the end of the PPA. According to Section 43, unless the power plant is procured under emergency situation in the country, the Transmission Licensee is required to follow competitive bidding process in procuring the power plants,” Edirisinghe claimed. Edirisinghe further said that Section 8 and 9 of the Act stipulates the requirements on ownership requirements for generators over 25 MW capacity and any generation plant procured under the due process and meets the requirements on the ownership can be issued with a license irrespective of whether it is a retired plant or a new power plant. With regard to the CEB’s claim that there is no reason for the PUCSL now not to issue generation licenses, because the Commission in 2016 and 2017 has issued no objection letters to the retired IPPs, Edirisinghe said that the Commission at any point had not issue generation licenses to any of the IPPs in 2016 nor in 2017. “The Commission granted a no objection to procure electricity from ACE Embilipitiya power plant in April, 2016, but not in 2017.In 2016, the approval for the procurement was requested by the Transmission Licensee and the no objection was granted by the Commission on emergency basis, where water supply to Mahaweli power plants were restricted and one 250MVA transformer is out of operation in Kotugoda Grid substation. However in 2017 and 2018, CEB did not justify that the procurement is conducted on emergency basis and hence, competitive bidding process was required to be followed. Since, this requirement was not met, the Commission was unable to issue even a no objection for the procurement. Further, the plant did not fulfill the requirements on ownership of the plants above 25MW, as per Section 8 of the Sri Lanka Electricity Act, to be eligible to be issued a generation License. Hence, the plant was not granted a generation License even in 2016,” Edirisinghe said. When asked what the benefits are to request CEB to procure electricity following Government procurement guidelines, Edirisinghe said, “That is the Law, and Law must be abided by everyone, especially the state institutions. It would ensure transparency, and there could be other parties and other technologies that meet CEB requirements (if any) at a lower cost, even these plants themselves may bid cheaper, under competition. If we don’t trust the competitive tender process, then that must be addressed without by-passing that”. To the CEB’s argument that in the event tenders are called these retired IPPs will certainly bid higher rates than what the CEB now pays them as the other power plants will bid higher prices to cover up their expenses to carry out EIAs and other instalment costs, Edirisinghe refuted the CEB’s claims. “Recent bids for Solar and Wind were in the range of Rs10-13, thus they could outbid these plants even with battery storage. We must keep in mind that what the country needs at this moment is energy (if at all) not capacity (we have 4,000 MW installed capacity while the peak demand is only 2,400 MW). CEBs’ practice of inaction and extending PPAs calling emergency requirements is not the fault of the consumer. There may be a transmission issues in the southern region, so that we need generation in that region; there are other transmission solutions to solve that transmission issue other than adding generation, all these must be explored before buying expensive power,” Edirisinghe said. However, Secretary MOPRE B.M.S. Batagoda is of the view, that there is no necessity to call for tenders when purchasing power from ACE Power Embilipitiya, ACE Power Matara and Asia Power. “Prior to the enactment of this Act, a decision had been taken by the Cabinet of ministers and the PUCSL to give their respective approvals to purchase power from these three IPPs. “The PUCSL and the Cabinet can give approval for these three IPPs which started supplying electricity to the national grid prior to the date of the coming into force of the Electricity Act. According to sub section 4 (a) of Section 43 of the Act, these power plants have been exempted from the requirement to submit competitive tenders. If the CEB says that electricity should be purchased to avoid a calamity situation and if these three IPPs are the only plants that sell cheap electricity to the national grid comparing to the other plants, why does the PUCSL want the CEB to follow a tender procedure? Do they want to purchase electricity at a cost?” Batagoda queried. Batagoda further said that he couldn’t understand PUCSL’s stance not to grant its approvals to these three IPPs although under the same conditions, the latter granted the approvals when CEB extended the agreements in 2016 and 2017. “At that time the PUCSL did not raise its objections, but now, as if it has woken up from a deep slumber, it says that unless power generation plants are selected following competitive bidding procedure, its approval cannot be given. What is the theory behind this argument? This Commission is maintained by the people’s money to provide a better service to the citizens of this country, but not to take care of certain power plants that supply electricity at a higher cost. As we have to purchase electricity to provide an uninterrupted power supply, we have to purchase more power. ACE Power Embilipitiya and ACE Power Matara supply electricity at the lowest cost to the grid with the price being in the range of Rs.20 to Rs.22. We also purchase electricity from 20MW plant in Embilipitiya, which is situated in close proximity to the ACE Power Embilipitiya. We purchase electricity from them at Rs.28 per unit. We also purchase power at Rs.36 per unit from factories that generate electricity with their own generators,” Batagoda claimed. When asked as to why he says that these three IPPs supply electricity at the lowest cost. His recent letter to the President’s Secretary requesting the intervention to obtain the PUCSL approvals for these IPPs giving the breakdown of unit prices, the CEB purchases, which show that there are few plants that sell low cost electricity, Batagoda said that those plants are owned by the CEB. When asked if the CEB owned plants can sell low cost electricity why can’t it acquire these three IPPs as directed by the former Finance Minister Ravi Karunanayake, Batagoda said that if the TEC and the Tender Board says that it is not viable to acquire for a higher price than the price given by the Chief Government Valuer, neither the Ministry nor the CEB has the authority to purchase them. Clarifying as to why the CEB continues to pay capacity cost for these three IPPs even after the laps of the initial agreement period, Batagoda said that the CEB has to pay a lower capacity cost to maintain these plants. “If we do not pay the capacity cost how can they run their plants? The country is heading towards a power crisis situation in 2019 and 2020 and we have to purchase more power. If we do not pay the capacity cost to them and if they refuse to supply electricity to the national grid what would be the situation? The electricity that generates from these three plants are insufficient and we purchase more from other plants. Having a PhD and with much working experience, I know how to discharge my duties genuinely by my country, but not like the way how Engineers and PUCSL officials work for an agenda. They want to look after their personal interests, but don’t work for the betterment of the country,” Batagoda charged. Meanwhile, when asked as to what happened at the COPE meeting, Batagoda said that the COPE members listened to his explanation carefully and asked him to send a report regarding the allegations levelled against the PPA. “This report will be send to the COPE within this week. They accepted what I explained and that was why I was asked to submit this report. The COPE pointed its finger at us based on the attacks by the media on us. I asked COPE to give us permission to purchase electricity at Rs.28, Rs 36 and Rs 45, which request was turned down by the Committee,” he added. Chairman COPE, JVP Parliamentarian Sunil Handunnetti However Chairman COPE, JVP Parliamentarian Sunil Handunnetti told the Daily Mirror, that the MOPRE Secretary was instructed to submit a full report on PPAs and why capacity charges are still paid to these three IPPs. “What we have observed is that there is a s huge scam associated with these PPAs,” Handunnetti said.